Waterloo – Wilfrid Laurier University’s Centre for Women in Science (WinS) welcomes members and hosts events rooted in the social sciences and creative arts as well as in the natural sciences. So it is only fitting that the centre’s fifth anniversary celebration will bring together visual art, music and science. The WinS celebration will be held on Thursday, Nov. 16, from 5-7 p.m. at the Laurier Library on Laurier’s Waterloo campus. It will serve as the launch of the art exhibit, “Her Spacetime,” by Tharanga Goonetilleke, a renowned New York-based, Sri Lanka-born opera singer and artist. Goonetilleke will both sing and speak at the anniversary celebration, which will be followed by a reception. The performance and speeches will take place from 5-6 p.m. in the Robert Langen Art Gallery on the main floor of the library. The art exhibit and related science demonstrations will be in the Community Engagement Space, also on the main floor of the library. The exhibit runs until Dec. 1 and is open to the public during regular library hours. Laurier Professor Shohini Ghose, director of WinS since its inception in 2012, met Goonetilleke when both were named to the prestigious TED Fellows program in 2014. However, it wasn’t until several months ago that they began talking about collaborating to celebrate women in science. 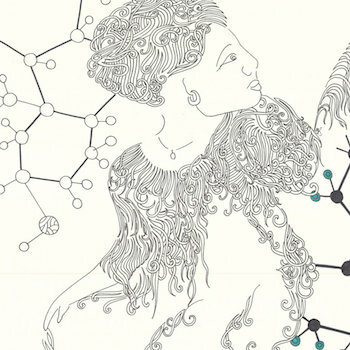 “We developed this interesting idea of creating artwork that explores the stories of women scientists from all over the world. So she’s created these unique new art pieces that reflect five women from different disciplines who we felt have compelling stories,” said Ghose. WinS promotes the participation of women in science through research, collaboration, networking and outreach. The centre has organized conferences, speakers and workshops; provided awards and funding to students studying science or gender issues in science; collaborated with other institutions and helped other groups to develop similar initiatives; and presented innovative public events such as graduate student Eden Hennessey’s #DistractinglySexist and #DistractinglyHonest photo-research exhibits focusing on sexism in science. The centre’s membership includes undergraduate students, graduate students and faculty members; natural scientists and social scientists who investigate issues such as the status of women in science and gender in the workplace. The student group meets biweekly and often holds frank discussions on members’ experiences as women in science. Ghose says she’s proudest of how students involved in WinS have benefited from the centre over the years. The Centre for Women in Science fifth anniversary celebration is free and open to the public. Those who plan to attend are asked to preregister by emailing wins@wlu.ca. Find the Laurier Centre for Women in Science on Facebook and Twitter.